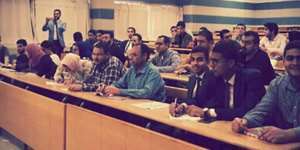 The faculty of Legal Studies and International Relations held a seminar on “Surrogacy in the Egyptian Law” on Tuesday 8/5/2018. The seminar was given by Dr. Mohamed Shehata, a Lecturer at the Islamic law (Shari’ah) Department. This was held in the presence of some faculty members, teaching assistants and a considerable number of faculty students.